There’s going to be plenty of change involving the Bridgeport High School football program in 2018. The coaching staff will see more than one new face and the Indians will have to find a boatload of players to fill in key spots, especially along the offensive and defensive lines. Change, however, isn’t just limited to the field. In fact, one of the most familiar voices for fans of the program has announced the 2017 season was his last. 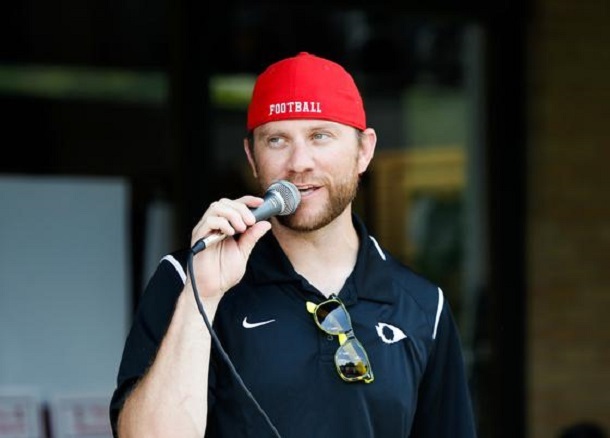 Long-time Indians color commentator, and 2000 Bridgeport High School graduate and former player Ryan Nicewarner won’t be back handling those chores. 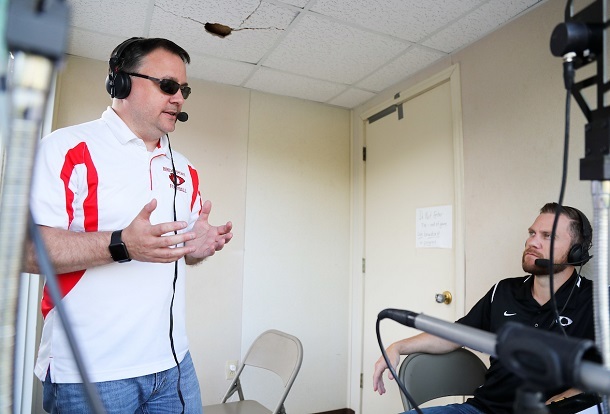 Nicewarner has served as the ying to “The Voice of the Indians” Travis Jones’ yang doing color commentary since 2009. However, Nicewarner’s duties go back further with the broadcast. 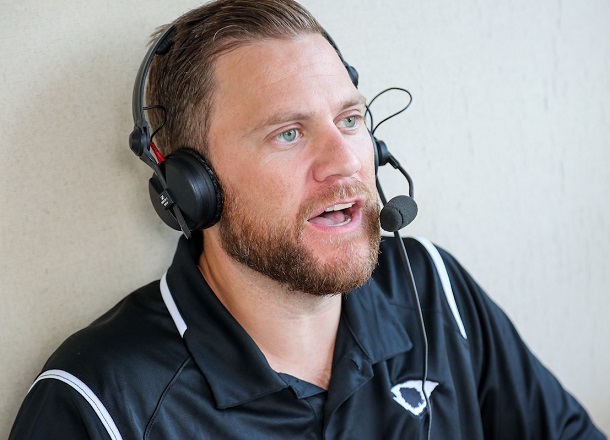 Outside of a couple of seasons handling other various media chores, Nicewarner began working with the WAJR program in 2001 doing on-field sound. He eventually moved to the booth to do statistics and eventually handled on-air work starting in ’09. Nicewarner doesn’t have kids who are of the age where they can easily take care of themselves. His four children run from age 7 to nearly four months old. While Jones admits losing him is tough on the professional and personal front, he doesn’t blame him. In fact, he’s happy for his friend. “I was blessed having him as long as I had him. He certainly deserves his weekends free with his family to be able to enjoy those kids. That’s time you don’t get back,” said Jones. Nicewarner said there’s not anything specific to do. He said he’s looking forward to putting his kids to be on Friday nights and maybe making a few more trips to WVU games. In particular, he liked to do what his wife Jamie, whom he’s been married to for nine years, wants to do if she has plans. While his voice will be gone, Jones said Ryan Nicewarner’s legacy is secure with the program. And not from his playing days or his time in the booth. While funds from the golf tournament go toward scholarships, dollars in other events provide a resource for coaches and the football program to turn to get needed items immediately. Jones said for staffs to not to have to worry about purchasing items thanks to funds being available, relieves a burden off those coaching. Still, Jones will miss his friend for reasons already listed. Jones said Nicewarner was a quick study in the booth. He said that was something else that impressed him. “He just learned it because, and he’d tell you this, he wasn’t a natural from the get-go,” said Jones, who said a new partner will be announced in the near future. “He just kept getting better because he knew the game and loved the game. The thing is there’s difference between knowing the game and being able to analyze it. Ryan could do both, and do both well. While you won’t hear Nicewarner in the booth, you may see him at a few games. He still plans on being around every so often. The BHS will miss you as well Ryan. Thanks for your time, effort and dedication to the program and its student-athletes. Now go and enjoy your family. Editor's Note: Top photo shows Ryan Nicewarner at last year's Lewis County game, while in the second photo he's shown at the 2017 Friends of Bridgeport Football Golf Tournament handling duties. In the third picture, Nicewarner is seated as Travis Jones makes a point during a road contest. 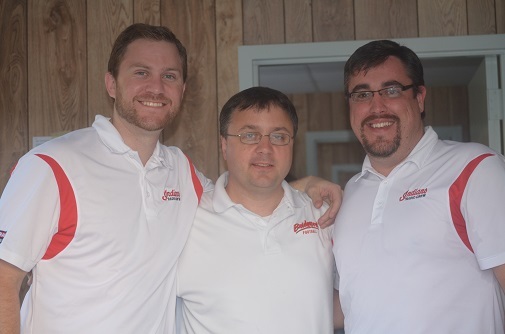 In the bottom photo, Nicewarner, left, and Jones, middle, are joined by another former member of the crew in Tim Brady.